Kona Coffee is world-renowned and consistently rated among the very best gourmet coffees in the world. If you are a coffee enthusiast you shouldn’t visit the Big Island without a trying out a good cup of Kona Coffee. You can do this as easily as with a well-placed order in a roadside coffee shack, a cafe, or restaurant, but you can also go on a farm tour. What happens on a Kona Coffee tour? What is the best month to go on a coffee tour? The world famous Kona Coffee beans grow only on two Big Island volcanoes. Learn all about Kona and other delicious Hawaiian (Ka'u, Hamakua and Puna) Coffees. There are now more than 650 coffee farms of all sizes clustered along the ±20 miles of scenic roads on the Hualalai and Mauna Loa slopes. Many of these farms offer tours to the public. During these tours you are typically shown around the plantation to see the growing coffee in the field. Then you are taken through the processes that are needed to go from a growing coffee bean to a cup of coffee (drying, processing, and roasting). Many tours end with a (free) tasting of the coffee, very close to a showroom or visitor center where you can buy the local coffee. Coffee farms on the Big Island are open for tours and tastings the whole your round, and the coffee they serve for the free tasting is always fresh. This means that there really is not a ‘bad’ time to visit. However! Coffee in Hawaii has a yearly growing cycle and depending on when you visit you will see other things in the coffee fields. 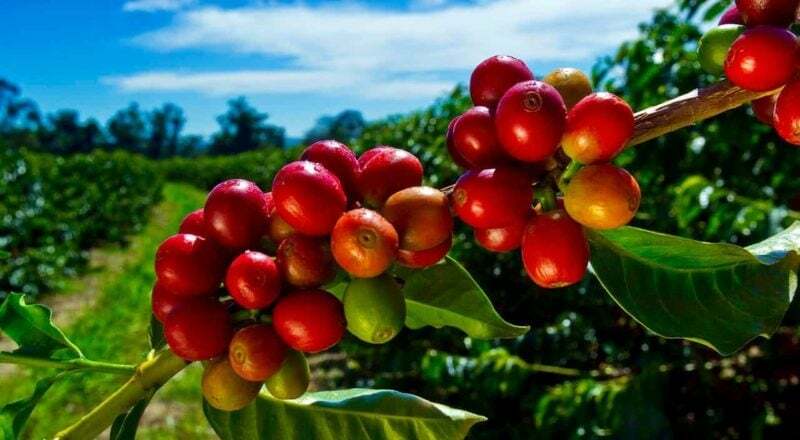 Our favorite stages of the coffee cycle are those between the blossoming (February + March) and the harvesting of the ripe, red, fruits (August). When coffee plants bloom in the months February and March they carry lots of beautiful, small and fragrant flowers. These flowers are especially impressive when you see whole fields of coffee covered with them. It almost looks like the coffee plants are covered in snow, and this is why the flowering fields of coffee are also known as “Kona snow”. When the flowers are pollinated they fall off and a small green berry starts growing at its base. These berries typically start appearing on the plants in April, and they stay green until they are red, ripe, and ready to be harvested. The berries turn so red that they are called “cherries” for their resemblance to a cherry. Not all the coffee berries ripen at the same time, and each tree needs to be hand-picked several times between August and ~January. What is the best time to go on a Kona coffee tour? Coffee trees love both sunshine and frequent rains, so expect both. As a rule of thumb, the mornings on the south Kona coast are sunny, and the clouds and rain appear after ~1300. Read more about average weather in Kona. So, if you like sunshine the best time to plan your Kona coffee tour is before noon. Visiting one (or a couple of) coffee farms during the day to learn about Kona coffee, to buy some coffee and of course for free tastings, is a great way to spend your day! In our experience it is convenient to plan the visit to a coffee farm in combination with for example a trip to the Pu’uhonua O Honaunau national park or with a snorkeling expedition to one of our favorite snorkeling spots: Kealakekua bay or Honaunau bay (two step). All the Kona coffee farms are located on or near the 20 miles of scenic country roads. Add to that the presence of a few shops, cafes, and the colorfully painted church, and you have the perfect excuse for a self-drive coffee tour. Plan about one hour for your visit, and make sure to check ahead of time whether you need to schedule a tour at your farm of choice. We list some of the coffee farms that organize tours on their property below. The farms are split between farms in Kona, farms in Ka’u, and coffee farms close to Hilo. We have also added all the tours listed below to a map, which you can see further down. Kona Coffee Living History Farm: is the only living history coffee farm in the nation. Their farm is open for you to explore but an admission fee is charged. More information on their website. Rooster Farms: has been a certified organic Kona Coffee farm for 30+ years making it the oldest certified farm. They also won the 2016 Kona Coffee Cultural Festival Cupping Contest. Quite impressive! Farm tours are free and available by appointment. The tour lasts anywhere between 45 minutes and 1.5 hours and includes a free tasting. See their website for contact details. Kuaiwi Farm: Grows coffee and cacao and offers a wonderful farm tour. Plan on a two-hour visit, tours cost $15/adult. Tours need to be scheduled, more information on the website. Sunshower Coffee Farm: offers private coffee tours with a in-depth cupping (specialty tasting) included, as well as roasting lesson where guests can roast their own coffee to take home. Tours are available 7 days / week but need to be scheduled in advance. $20/tasting. More information on their website. Heavenly Hawaiian coffee farms: Organizes free tours from Monday to Saturday between 9am and 4pm. The tours are “farm to cup” and are concluded with a tasting on the lanai. More information on their website. Mountain Thunder Kona Coffee: Organizes both free and VIP tours. No reservation needed, tours start every hour, 7 days/week. More details at their website. Buddha’s Cup: Winners of the 2010 Kona Coffee cupping competition, 3rd place in 2014. Complimentary Kona coffee tastings and tours are available at their farm, which is open Mon-Fri between 9 am to 4 pm, and Sat between 10 am and 2 pm. See their website for more information. Wailele Estates Plantation: Organizes free 1- to 2-hour tours during their harvest season (July through December). Please call or email ahead for personal tour appointments. See their website for details. Ueshima coffee (UCC): Organizes tours on their estate, reservations are needed and can be made on their website. Holualoa Kona Coffee Company: Self guided tours Monday through Friday from 8 am to 3 pm. at their Kona Le’a plantation. More information on their website. Hula Daddy Kona Coffee: is open Monday through Friday from 10 am to 4 pm. Tours of the orchard and the roasting room are free. More information on the website. Greenwell Farms: organizes free tours throughout the day. More information on their website. Kona Joe: Open all days from 8 am to 5 pm. Free self-guided tours and paid guided tours. More information on the website. The Kona coffee fest is curating a complete map with coffee plantations in the South Kona district, which you can find here. The Ka’u coffee mill: organizes free ~30 minute tours of their orchards 3 times a day. Find out more on their website. Long Ears Coffee Co: Organizes tours that need to be scheduled ahead of time. See their website for details. 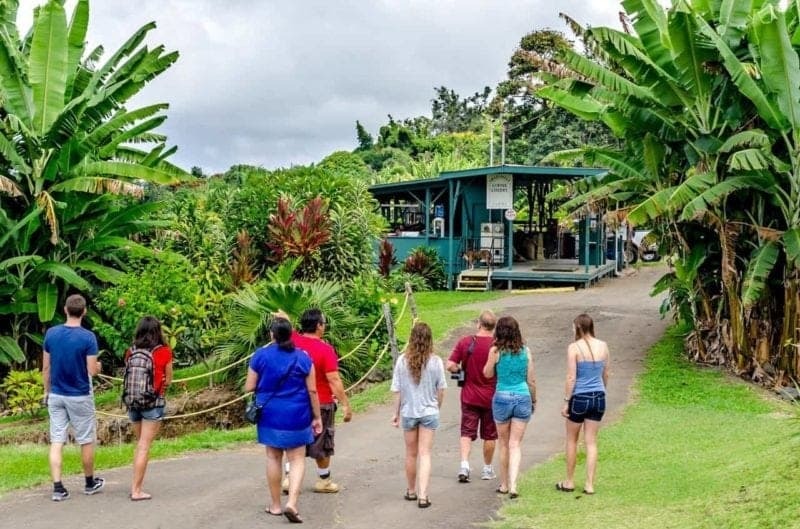 Hilo Coffee Mill: Tours of the farm and mill that need to be scheduled. See their website for details. We summarize all coffee farms that organize tours on their property in the map below. We also included a few tea plantations that organize tours and tastings at their farms (green symbols). The other very tasty Big Island coffees that are not “Kona” (but that are as tasty and more affordable ).